February 9, 2012 – FIRST POSTING TODAY. This coming in now: A discussion between this writer and a source in Lebanon named Farid, whose ties to progressive forces are formidable, says that Mikhail Fradkov displayed frustration with the Syrian opposition’s unwillingness to sit down with Dr. Assad’s government without preconditions. Secretary Fradkov made it clear that the Russian government believed that an unlimited assault on the opposition in Homs, parts of Idlib and Hama, would be necessary to break the will of the opposition and, especially, its Western sponsors, France and the U.S. This position came straight from President Medvyedev and P.M. Putin. The Russian view (which may be shared by the Chinese) is that a negotiated settlement is necessary to avoid any future break-out of a similar kind but that any talks had to be with the administration of Dr. Assad. The Syrian president himself has played along with the Russian stratagem if only to buttress Moscow’s appearance as a good will broker. Assad, it is reported, is fully aware that the so-called Syrian National Council will not sit down at any round table with his government. Dr. Assad’s advisors appear to be satisfied with this understanding and are playing along dutifully and loyally. 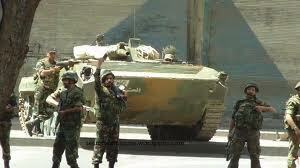 Homs today was a scene of skirmishes between the Syrian 4th Armored Mechanized Division and terrorists fluidly moving between the tightly placed tenement dwellings in Baba Amro and Khaldiyya. The terrorists did not put up much of a fight having decided to use hit-and-run tactics against the vastly superior 4th Division under the command of Maj. Gen. Maher Al-Assad, the presidents youngest brother. It appears that for the next few days we are going to see the Syria army blast its way into the narrow alleyways of Homs, trying to evacuate civilians as much as possible while keeping surveillance over movements of terrorists from rooftop to rooftop. I have not heard of helicopters being deployed yet, but Syria does have a fleet of Hind attack copters and has used them in Idlib Province. Zabadani is all but under the complete control of Syria’s Republican Guard, its former occupiers heading for Lebanon to be received by the Lebanese Army. Those who try to work their way to Der’a will find that area has been sealed off and inhospitable. The Syrian Third Army Corps is being tasked with protecting the borders with Lebanon especially at historically active smuggling routes that are now all but tightly corked. There is capital punishment today in Syria for arms smugglers so they had better be deeply committed to their cause or the afterlife. In Idlib, the terrorists have commandeered a fleet of tourism vehicles, usually vans from Korea or Japan, being carried on specialized trucks. Those who think that the Syrian government is being driven into bankruptcy are seriously misguided. Syria is planning for a banner tourism season and the vermin has to be driven out. I will have another post today.